We have arrived safely in Ondangwa. In fact, we arrived yesterday and had a very pleasant, although as always, long trip up. 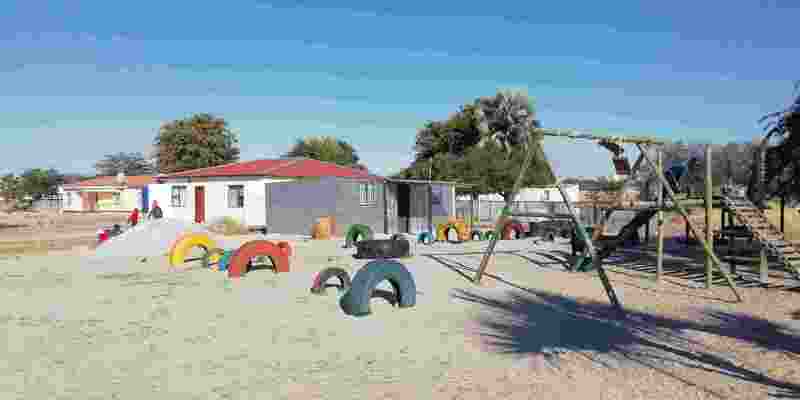 We travelled for three days sleeping over in Grunau and Okahandja. We have settled into living with George Jeremia and family very easily and well. We just thank our Father for this blessing. Our team is working well together and it has been very interesting getting to know everyone. One of the constants here is the constant change. From year to year there is constant new developments and where we had a landmark last year, this year it is gone, or another building has popped up and our landmark is obscured. Today saw us at the first church for ministry. St Lukes, at Omungwelume, has always been the furthest church and therefor often neglected. There are now churches further but today we were at St Lukes and had a number of firsts for those of us who have been coming here for some years. This was the first time there were any men to minister to, the first time there were more than 15 women (we counted almost 30), the first time there has been significant numbers of children and youth – close on 90 combined. Most of the youth attended with the children and then most of the children attended with the youth. Michael Simmons spoke to the men, all 4 of them, and there was much discussion afterwards. Marion Edmonds-Smith spoke to the ladies and they had a great time with singing, talks, testimonies, a reminder of how we had been praying for years for leaders here and also the history of how Lukas and the other pastors came to leave ACSA and join REACH NAM. Kathy Noland led the children and Sphelo Mlungu the youth. Both had very responsive participation and were ably assisted by others of the team. 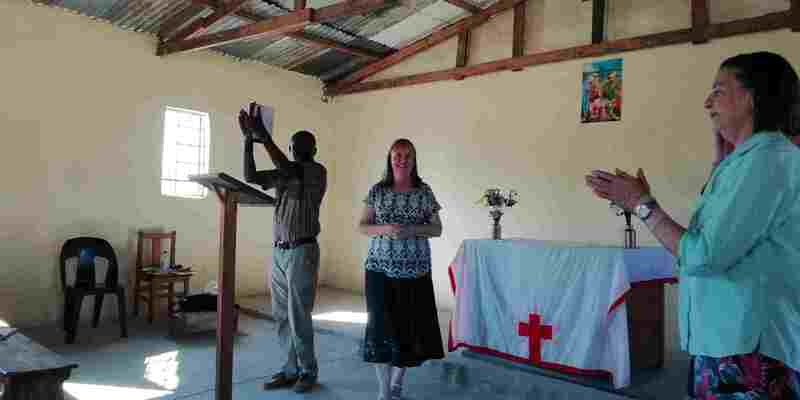 The pastor here is Robert Nakwatumba and assisted by Meme Victoria it would seem that there is much progress from previous years. The children and youth numbers was the most noticeable change. 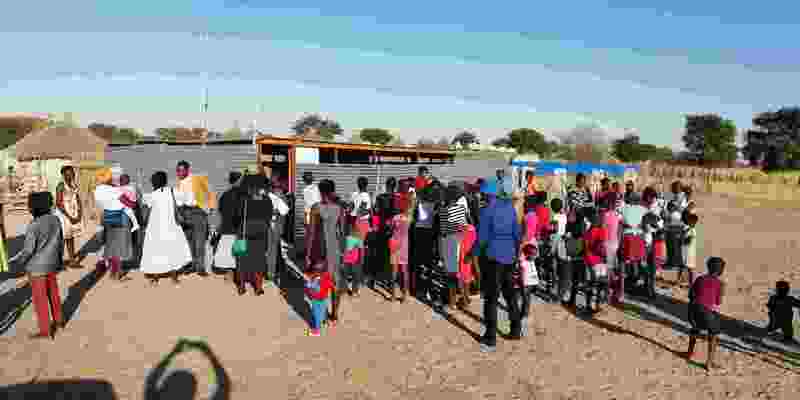 For this trip 42 Bibles were donated and we were able to make these available and soon there was a stream of people buying the Bibles (we buy them for N$175 and then sell them for N$50). We buy them from the Namibian Bible Society at R175 and sell them at R50. To see people finding the money and with great appreciation being able to but their own Bible is certainly a very special moment. One lady asked for 8 so that she could take them and sell them to her neighbours. A short time later she returned with the money she had sold them for. Praise God for these Bibles and the difference they will make for His kingdom! The record number of children intently listening to Kathy. After Marion taught the ladies, Meme Victoria gave a testimony of the work we have been doing and what a privilege they have had in us coming to them. You really have to be here to feel the passion and gratitude of the people. 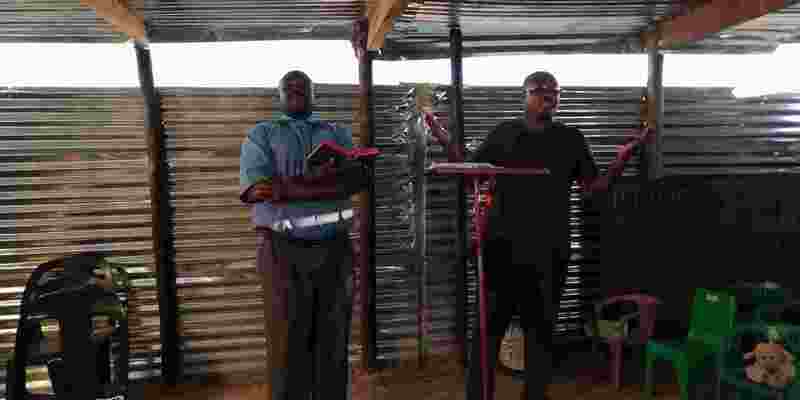 Muriel spoke about the road that the team had walked in prayer for men and a leader in particular, showing how God had answered this prayer in Lukas and the other pastors who left the ACSA denom here and joined REACH NAM. Lukas then also told the story from his side. Here we have the youth listening to Sphelo. Just look at that group! We have never seen these numbers at this church before! In the doorway is Tate Joseph, the 107 yr old who has been coming tou our presentations here for about 3 yrs now, and he walks there. Tomorrow it is our plan to minister at Christ Church Ondangwa. Here we will also be starting a first, the first time that we will have ministry to the women who are in formal employment. They have typically been missed out since we normally meet at 12h00 so this time we have an additional time for them at 17h00. Please pray that this will be a great opportunity for the Gospel as these ladies mix with many others and have time and place to make much impact for the Kingdom. We praise our Saviour for the wonderful day of ministry we had today, for lives impacted, many new friends made and the Name of Christ lifted high. Pray that as we get more into the daily rhythm of ministry, we won’t become casual about what we are doing and also the exhaustion won’t mean less or hurried preparation. I often find our time in Namibia to be an amazing blur of activity and before one knows it we are days into our time here. We have now visited four churches and tomorrow is Sunday with us visiting, and preaching, at two churches. But let’s catch you up on what our God has been doing over the past few days. 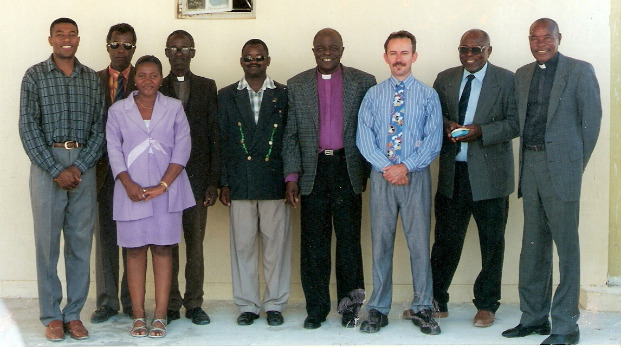 On Thursday we visited Christ Church Ondangwa. We arrived for a 12h00 start but apart from Denys Nandi, one of the pastors who has been involved in these churches here for decades, there wasn’t really anyone else. He said that the people had been invited. After waiting a few hours, we went to have a small bite to eat and returned just after 16h00. Here we have Kathy getting the younger children’s attention, with able help from Caitlin and Dawson. 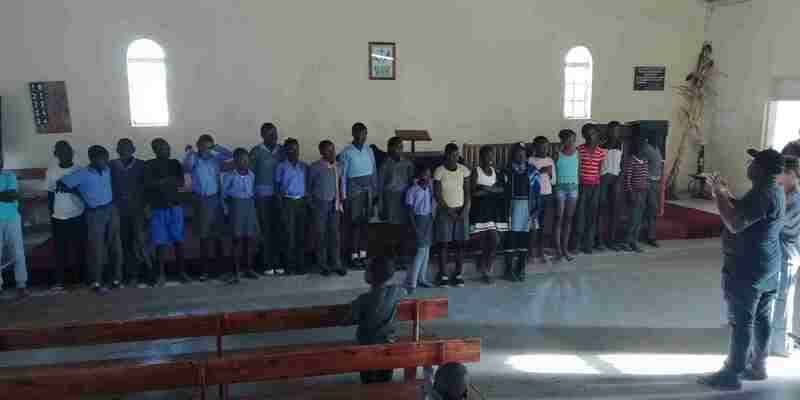 The older youth, essentially high school children, were inside the church with Sphelo and Michelle. This is Marion with the ladies who normally cannot come due to work commitments. This group grew as the time passed. This was a first and was at their request. What a privilege to be asked to add this to our programme. The metal structure in the front is the new pastor’s home. This houses both the Christ Church and St Peter’s pastors. The brick building behind it is the next-door neighbour. Most of the team found this to be a difficult day but we are about our Saviour’s work. Other than the long wait to get started, once we got going it was a good time. The new ladies group was very responsive including the younger girls. Please pray for this group as they are the ladies in business have potentially have many contacts who seldom will attend church to hear of the saving love of Christ. 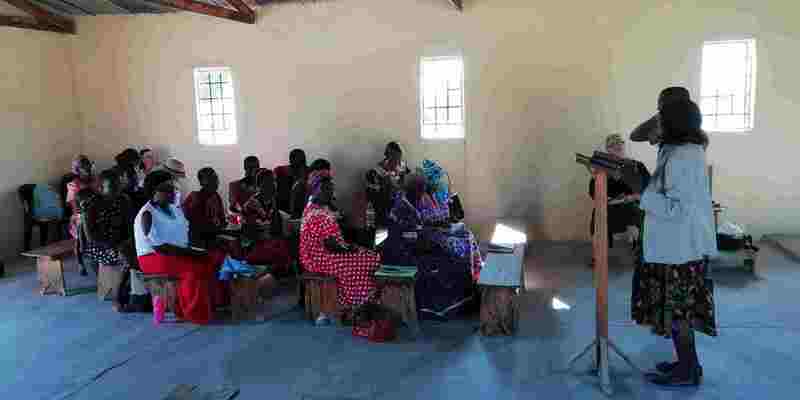 Due to shortage of space, Kambauh, the pastor, had arranged for everyone to be inside the church building. As you can see, it is already almost completely full. Kambauh shared with me his 5 year plan; to build a new church in 3 phases of 7 x 14 m brick buildings. From the offering they set aside money each month to buy cement and from that the youth are taught how to make bricks, of which there are already nearly a 1000! There has been a long negotiation with the headman for property but to no avail. Eventually Kambauh, with his family fully in support, told the headman that he is donating his entire property to the church. He now lives as a missionary on the church property. The headman is still processing this. Please pray that he will not only allow this property transaction to remain but especially that he would be converted by Kambauh’s testimony. Part way through our programme we stopped for a break which was refreshed with tea, coffee, water and sandwiches. In the image above, you will see the crowd enjoying this and to the right of the tin church you ca see where the first phase on the new church is planned. Here Sphelo is teaching the youth with much vigour. Kambauh kept telling him that he wanted him up here with him. Our time here was really special. This church structure was at capacity for the duration of our time here except that Kathy and Michelle took about 70 little ones out. The church didn’t seem any emptier when they left. Our speakers for the day were Kathy, Morne (his first talk in a Christian context and he did very well), Carol and Sphelo. Near the end one of the ladies stood up and thanked us for coming to them and noted with gratitude that we only wanted to speak about Jesus and the Bible and not churches and which is better or worse! Again, I need to say that our team is really doing an amazing job of clearly presenting the Gospel and regularly lifting high the Word of God, that it is Authoritative, without error, complete, sufficient and effective. Praise be to our God! At this point I just need to say that the old idom of an army marches on it’s stomach is still true and Muriel, with a little help, is managing to keep this part of the Lord’s Army marching extremely well. Here we have the congregation enjoying Sphelo’s talk. Very little sitting around when he speaks. Kathy and Michelle teaching the little ones. These children are the next generation and it is such a blessing that we are able to impact them for Christ. Please pray that all the pastors and others will give them the attention they need to start them on the right road with Christ as their King and Lord. 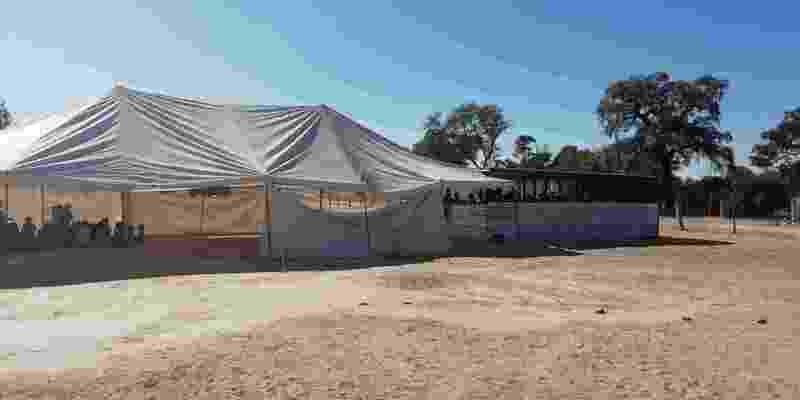 The church is the metal building on the right, the tent was hired for an event last week when a couple of hundred people attended. At the end of the service is normally time for the paparazzi, and this can go on for 30 minutes without too much trouble. Everyone wants a photo of themselves with the visitors. This is Lukas’ homestead and on the right are some of the congregation having refreshments after the service. Today was probably the longest day for us but at the same time a day filled with many amazing things. We started just after 11h00 and continued until just after 16h00, with an hour break for all to stretch. After the service there was the photo session, then another meeting with a number of ladies who has some deep questions, following by much socialising and eventually a time of refreshment that they had prepared for us. We left there at about 17h30. There is a deep desire to know the Scriptures and to follow God’s Word. Many of the questions revolve around how to be a better Christian, how to do what God’s Word teaches, how to stop doing the practises we have grown up with etc. Yesterday our team split into two since we had Michael preaching at Christ Church Ondangwa and Sphelo at Genesis Onamutai. Both went well but very differently. Those at Christ Church had a simple no frills service with a moderate number of people attending. Those at Genesis (which we have found is on the property of Lukas Katenda’s homestead) had a service that extended for almost 2 hrs (not too long) and while Sphelo had prepared for his sermon at a point when all the children had been called to the front he was approached and told that the children where now there, so he could speak to them. He literally had to work out was he was going to say on his way to the front. He did very well. After the service we were again spoilt with some eats. This is also interesting because we are told that there is some water prepared for us. That is another way of saying there is food and drink available. On the way one of the vehicles came to its end. The charge light had been flashing earlier in the week and we had taken it for testing but were told all was ok. Now it came to a stop with all the systems down. Today we took the vehicle to the local Mercedes agents for diagnostics. Initially we were told that they didn’t think it was the alternator but just the battery. When we go there we discovered that they had replaced the battery and now discovered that the alternator was not charging the batter. Tomorrow we will tackle this problem again. They have said that there is no alternator for that vehicle here so we will have to source from RSA probably. Today we also went to St Peters in Onamambili. One man arrived and there was no translator so very little could happen. The ladies saw about 12 ladies and had a good session. We also found here that there is an urgent need for Bibles. Of the 42 that we brought up (donated by one of our REACH NAM churches) there were only 3 left. At all the churches this has been the primary need – praise God for this desire for His Word. There were no youth and about 15 children and Kathy and Michelle, with assistance from Dawson and Caitlin, did a great job. Tomorrow and Wednesday we are due to have a mini-conference at Christ Church Ondangwa for all the REACH NAM pastors, lay leaders, Ladies leaders and wives, the Youth leaders and the Sunday School teachers. Some of the churches we have been to knew nothing about this while others seemed to be under the impression that it was for everyone to attend. So, at this stage we really don’t know what to expect and how the two days will play out. That the conference will happen, that the people will arrive and learn much that they can use in their respective ministries. Also, that there will be sufficient translators. That we will be able to get the vehicle repaired soonest. We are due to leave on Friday for Windhoek and cannot leave without it. This will in turn impact the conference scheduled in Windhoek as well as our accommodation there. 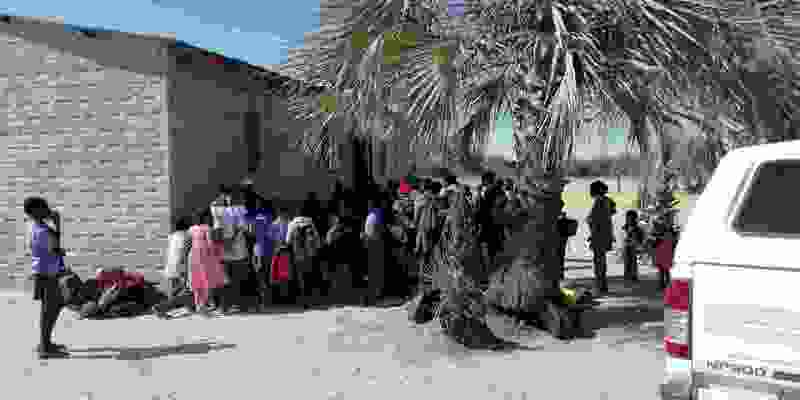 Every year we are here in Namibia this day catches me a little off-guard, our last day in Ondangwa. We do still have 3 days in Windhoek, but we are now effectively finished with ministry here. It arrives suddenly and then we realise we need to be saying our goodbyes. Our hosts have been very gracious and accommodating and it has been wonderful being able to stay here with George and Ida Jeremiah. Please thank our Lord for this family and pray for their one son and daughter who are seeking employment post completion of their respective degrees. 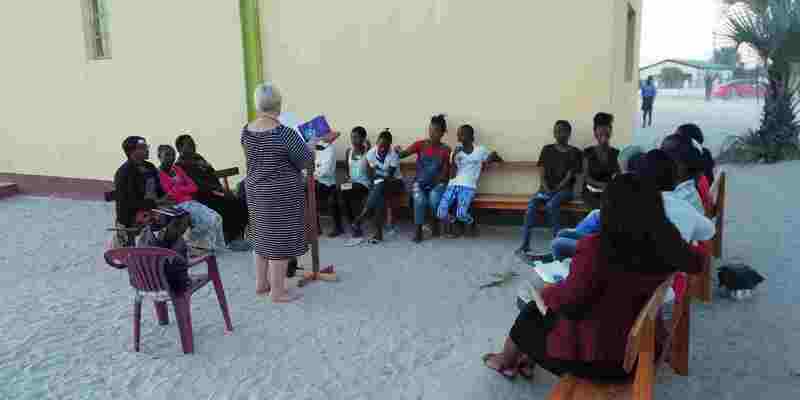 Tuesday and Wednesday saw us ministering at a mini-conference here in Ondangwa and this was a special opportunity for the team as we brought God’s Word to the leadership of the Ovambo churches. Here you see some of the 20 men crammed into the church office. Michael spoke for most of the first day on discipleship, followed by Morne on day two with Evangelism, Sphelo on training youth workers and the importance of that, and myself on the marks of a healthy church. These men, for the most part, were really interested and just wanted more all the time. 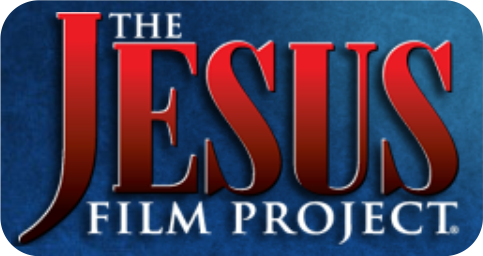 Please pray that they would have grasped the importance of Evangelism and that it is not just to tell people about God as many seem to think. Due to some donations we were able to leave 3 excellent books behind for each of most of the pastors. Carol taught on the Big Picture of the Bible (Biblical Theology) and followed that will teaching the Two Ways to Live (seen above). Kathy, on day one worked with 4 ladies who were aspiring Sunday School teachers but since they were also Ladies Workers the two groups joined on day two. 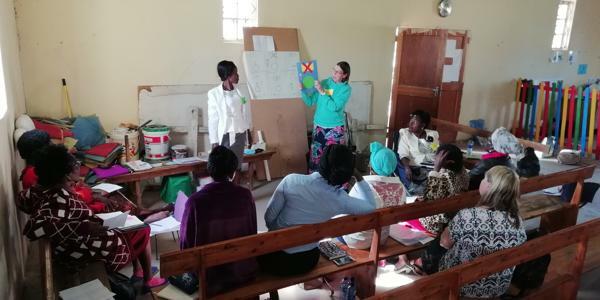 Kathy then taught them how to study the Bible using the Discovery Bible Study method followed by teaching, in pictorial format, why we need to teach the Gospel to children. Please pray that this has a great impact as internationally somewhere in the region of 80% of all people who have been saved were saved before the age or 21 and in most churches the children’s work does not have nearly the same attention as that of adults. One of the things that we constantly forget is the many challenges that they face on a daily basis are things that we just take for granted. Most of them have very little if any access to the internet, no theological works, or anything else for that matter, in their own language, very little access to sermons, speakers and examples to follow. Most of them have no vehicles of any kind so have to walk or catch a taxi. None of their homes have electricity or running water. The list doesn’t stop there, but I will as I think you will get the picture. Today is a breather day as the team rests a little but also the day we need to pack up here and prepare for ministry in Windhoek which is due to take place on Sat and Sun. Also, Sphelo will be preaching at the Bethlehem church. Our vehicle is not yet on its wheels again but we managed to get the alternator repaired in Oshakati. A McGyver repair was needed as the specific part needed was not available anywhere in Namibia. Pray that this will hold for us to return to Cape Town. Muriel and Michelle looked after this group of children so that their moms could attend without distractions. This was somewhat of a challenge due to the small space but they did a stirling job. Carol, Marion and Kathy took turns teaching the ladies and children’s leaders. Some of the time was very difficult as the ladies seemed to only become responsive after some time. Please pray that they will have heard the Word clearly and will apply what they learnt. Sphelo spoke to those interested in youth work on day 1 while Michael and Morne spoke to just the men on day 2. 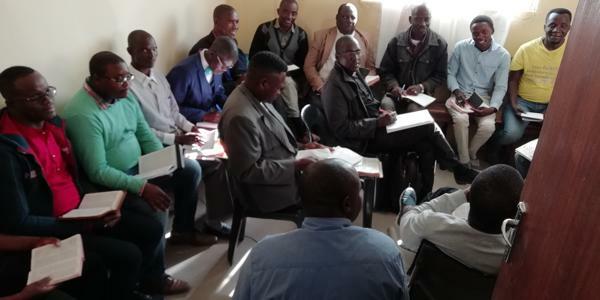 The six men who attended were all from Bethlehem church and were very excited by what they learnt and wanted to meet with each other regularly so that they could hold each other accountable and also ensure that what they learnt would not be forgotten but rather acted on. 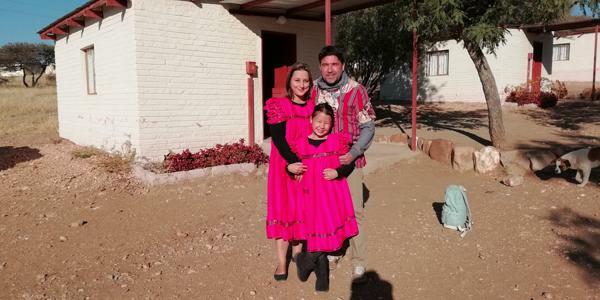 Morne, Michell and Caitlin in traditional wear. 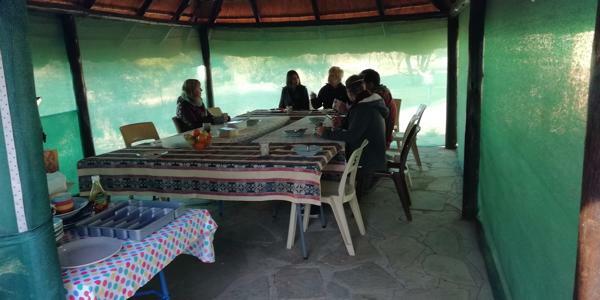 While in Windhoek we stayed at the Shalom Centre and here you can see some of us in the boma which served as our meeting and eating place. The centre is very spartan but we made it our home for the time we spent in Windhoek. It was great getting to know the staff here and we all learnt much from each other. We met some very interesting, out of the ordinary people while here. 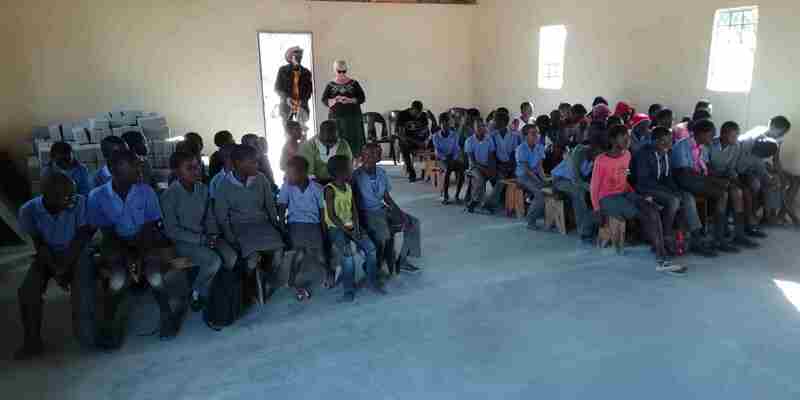 The first was one of the teachers from Eluwa which is a school for deaf and blind children in Ongwediva which is just south of Oshakati. Then we met a lady who is involved in translating the Bible into a new version for Oshikwanyama from Hebrew and Greek. This is very exciting as the translation is not optimal and we found a number of places where words were incorrectly translated. We also met a lady who sign for the deaf on Namibian TV. She started learning to sign almost by accident and now sees this as her ministry as she gets to attend many important functions and has opportunities to speak for Christ there. Today we also went to the Bible Society of Namibia and set the wheels in motion to open an account with them for REACH NAMIBIA. At all the churches we ministered at there was a deep need for more Bibles. Once we have this account, people will then be able to donate directly, and we will be able to then get these Bibles at a 20% reduction which will mean that we can buy more for the people of our churches. From myself, on behalf of the team, we would like to thank you very much for walking this road with us over the past two weeks and praise our Lord for all we have learnt and had the privilege of sharing here in Namibia with the REACH NAMIBIA churches. We left Windhoek early on 10 July and had a very good trip south to Grunau where we slept over. We arrived there in mid-afternoon which enabled us to explore the little village and also get to know some of the people there. 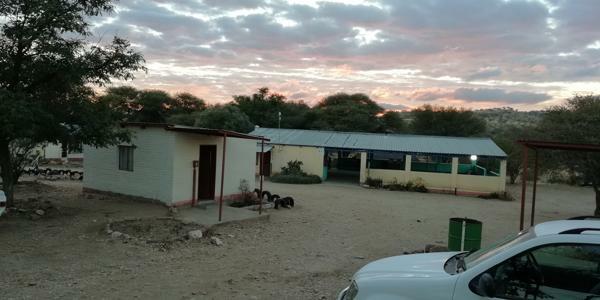 I need to mention here that if you are ever travelling in Namibia and need to sleep over at Grunau we would all highly recommend that you use the Grunau Country Hotel. The owners, Stephan and Susan Coetzee will make your stay very pleasant. The accommodation is simple but very comfortable, clean and refreshing. There is also a restaurant with tasty meals. Don’t be led astray by the Hotel in the title as it is more Motel like. 06h00 on 11 July saw us on the road south again with our last re-fuelling stop at Noordoewer to get the most of the cheaper fuel in Namibia. We brunched (breakfast and lunch) at Klawer and then it was homeward. We all arrived safely and have had to make the adjustment back to our city lives quickly as most had to return to work on Thursday. 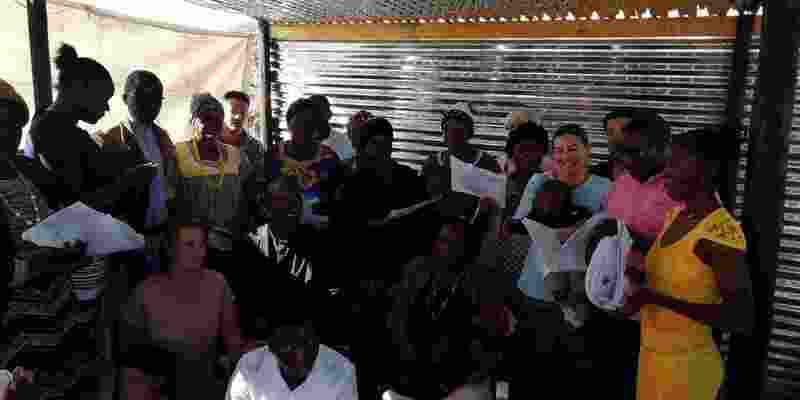 The team was richly blessed of God by the time in Namibia and we ask that you please continue to pray for the pastors and other leaders there as they seek to honour our Saviour in far more challenging conditions than any of us face here in South Africa. To the glory and honour of our precious Saviour Jesus Christ! The team for this year’s trip was really small, it ended up with just my wife Muriel and myself. The trip northwards was, as always, a long one, but it was a pleasant drive and without any serious problems – one flat tyre was the only hiccup. We stayed at Nakambale as usual and it was great to reacquaint with Maggie who looks after the Museum and Rest Camp. 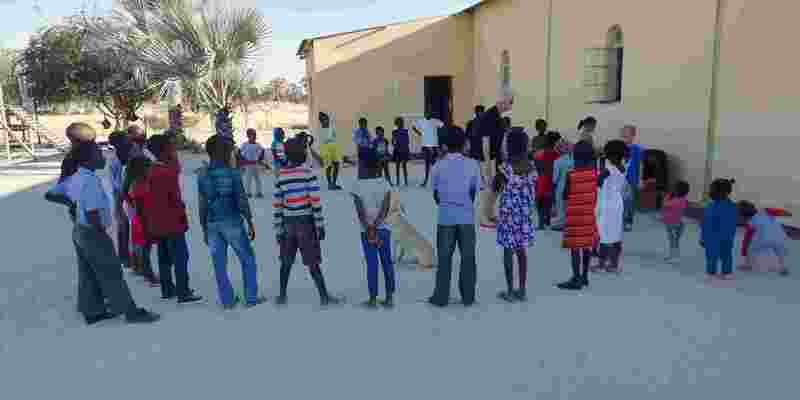 A smaller than normal team of 14 members made the long trip northwards to Ondangwa. The purpose of the mission was much more focussed than previous years. 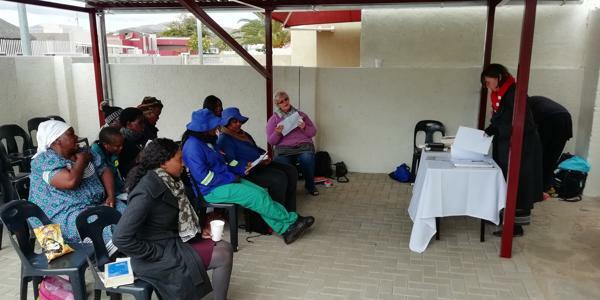 We wanted to specifically pick up from where Tish had left off with the training of the lady leadership and build some playground equipment for the play schools that Tish had envisaged. 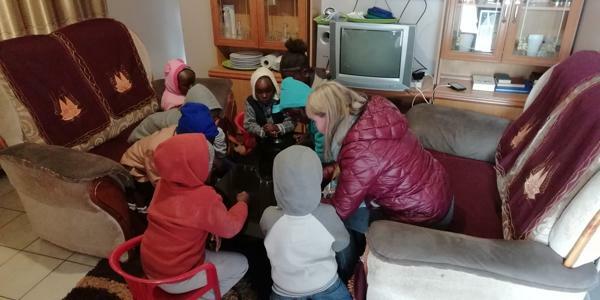 The team did not travel together as some were already in Namibia before mission and some needed to visit Outjo to meet with the team behind the training that the play school ladies had done. By Monday 30 June we had all arrived at Nakambale Rest Camp, welcomed by fasithful Maggie as usual. The team for this year consisted of a very balanced group in almost every respect. 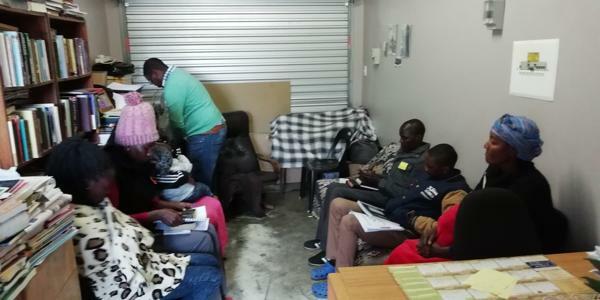 There were 8 men and 8 ladies, ranging from 16 to 73, and coming from 6 Western Cape CESA churches. Our two training days went off very well and the team was well prepared. All too quickly it was time to leave, which took place from an Engen service station in Bothasig at about 22h00 on 22 June in 3 vehicles. We met up with the fourth vehicle just past Malmesbury. 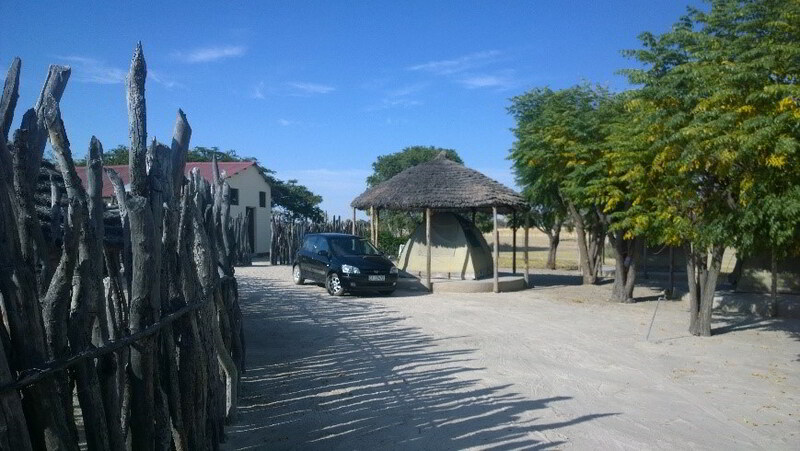 The trip to Ondangwa is a long 2200 km which we took two days to complete with a stopover at Hodygos in Okanhandja. One never really gets used to the distance and it always seems like we just cannot get there but eventually we all did and got ourselves unpacked and set up in the Nakambale Rest Camp, welcomed by Maggie as usual. It was with a great sense of anticipation that the Women’s ministry team embarked on ministry this year. 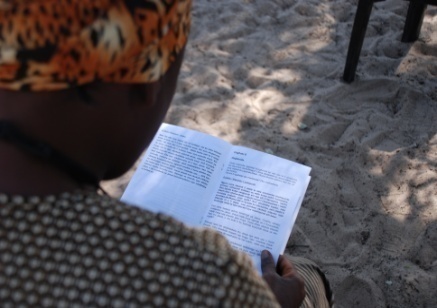 We had clear material, translated into Kwanyama and printed into booklet form so that each woman would have something to take home and refer to in the future when sharing the Gospel with friends and neighbours. The material “Understanding the Gospel” had been compiled by Alan Noble and translated by Denys Nande and was loosely in the form of EE2. Our programme was jam packed with activities, both teaching and crafting were planned into our schedule and we found it worked very well. This was the first team trip. The main purpose of the trip was that leaders in the cape would be part of a team to be of specific help to Bishop Kalangula. Quinton van Rooyen led the team. The trip was low key and spent much time getting to know the people and the churches. In October of this year George van der Westhuizen and Colin Banfield attended the Grace Conference in Windhoek. At this time the GO Outreach (a short term mission to Franschhoek and surrounds) was functioning well but there was a need for something beyond our borders. 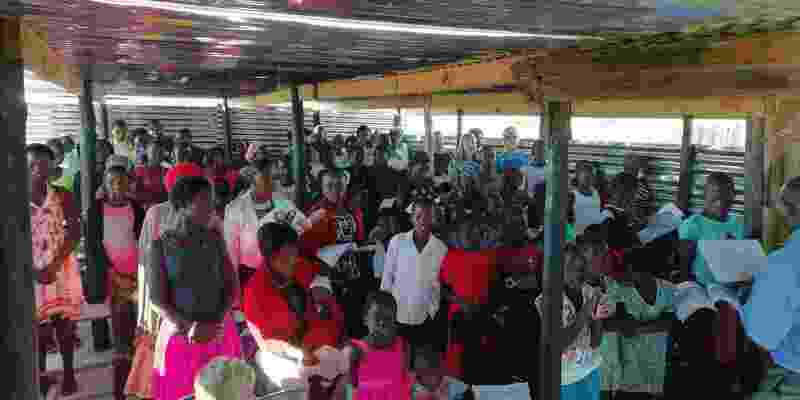 Colin Banfield and Mike Emslie thought of extending this mission to reach out to churches in Ovamboland – based on Colin’s knowledge gleaned during the trip of 2000. An exploration team was put together of Colin Banfield, Lisa Harvey (now Craye), Tony Pitt and Jason (Colin’s son). Much of the trip was preparing the way ahead for the first main missionary trip which would take place midyear 2004. At this time Trevor Wecke and his wife were planning on going to Ovamboland as a missionary, so a meeting was held between Colin and the exploration team and the SIM leadership to discuss the needs of Ovamboland in terms of a full time missionary. The idea was that Trevor would be a curate to Bishop Kalangula under SIM. The plan for the Weckes to go to Namibia. This didn’t materialise due to a number of reasons. 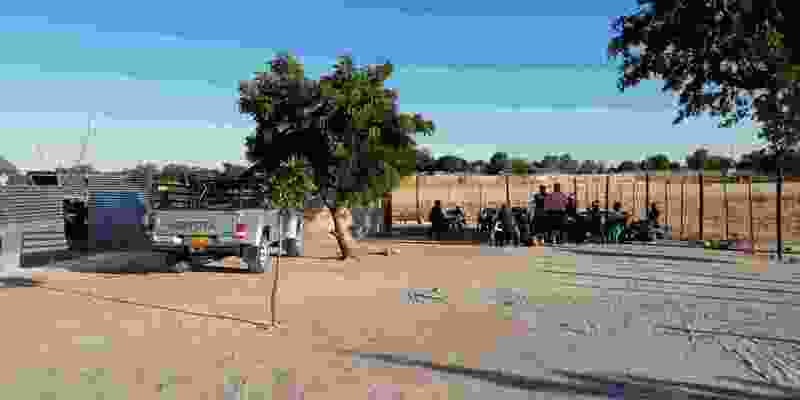 The exploration trip went very well, with the petrol and camping stops planned as well as a deal made with what has since become the team campsite near Ondangwa. 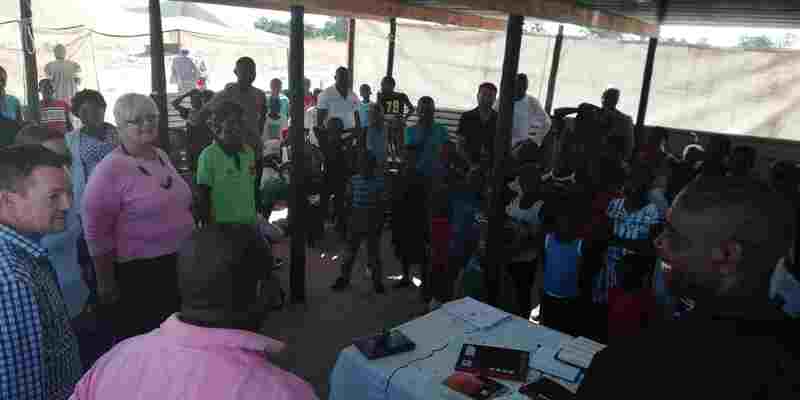 Many contacts were made among churches and leaders in Ovamboland, with doors opened for ministry within the Anglican and Lutheran churches as well as the CESA churches. The steering committee – Colin Banfield (Chairman), Lisa Harvey (Personal Assistant) & Johan Dreyer – planned and organized this trip with help from some of the team. Johan Dreyer was not able to accompany us due to a prior engagement. The main purpose of the trip was to get alongside key people in our Churches in the North Central Region of Namibia and to offer them fellowship and training in a few specific ministries. We asked the leadership in Namibia to tell us which particular ministry skills they wanted us to concentrate on and also to try and identify potential folk who we could train.